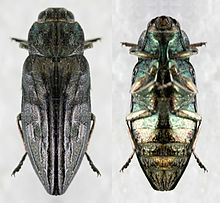 The term woodboring beetle encompasses many species and families of beetles whose larval or adult forms eat and destroy wood (i.e., are xylophagous). Larval stages of some are commonly known as woodworms. Woodboring beetles are commonly detected a few years after new construction. The lumber supply may have contained wood infected with beetle eggs or larvae, and since beetle life cycles can be one or more years, several years may pass before the presence of beetles becomes noticeable. If you have an infestation of woodboring beetles, it is best to consult a professional entomologist before contacting an exterminator. In many cases, the beetles will be of a type that only attacks living wood, and thus incapable of "infesting" any other pieces of wood, or doing any further damage. In other words, only some types of beetles should be of concern to a homeowner or a household (see list below)[clarification needed], and exterminators may be unable or unwilling to make this distinction. Spot application of pesticides; however, most effective insecticides are obtainable only by certified professionals. Freezing. Infested furniture may be wrapped in plastic and placed in walk-in freezers for several weeks. Heat Treatment. Timber is heated to 50-70 degree Celsius for a few hours. ^ Hickin, Norman E. (19 June 1958). "Woodworm and its control". New Scientist 4 (83): 202–204. "About three hundred different species of wood-boring beetles are known as occurring in our domestic woodwork indoors, but of these only seven are of frequent occurrence, and it is to the larval or grub stage that we apply the description 'woodworm'." V. R. Lewis, Environmental Science, Policy, and Management, UC Berkeley; and S. J. Seybold, USDA Forest Service, Pacific Southwest Research Station, Davis, Calif. "Wood-Boring Beetles in Homes". University of California Agriculture and Natural Resources, UC Statewide IPM Program, UC ANR Publication 7418. University of California, Davis. Retrieved 2013-06-05. Barb Ogg, PhD, Extension Educator. "Wood-destroying Beetles". University of Nebraska–Lincoln Extension in Lancaster County. Retrieved 2013-06-05. John A. Jackman, Professor and Extension Entomologist. "Structure-Infesting Wood-Boring Beetles". Texas A&M AgriLife Extension (the Texas A&M University System). Texas A&M University Department of Entomology. Retrieved 2013-06-05. This beetle-related article is a stub.